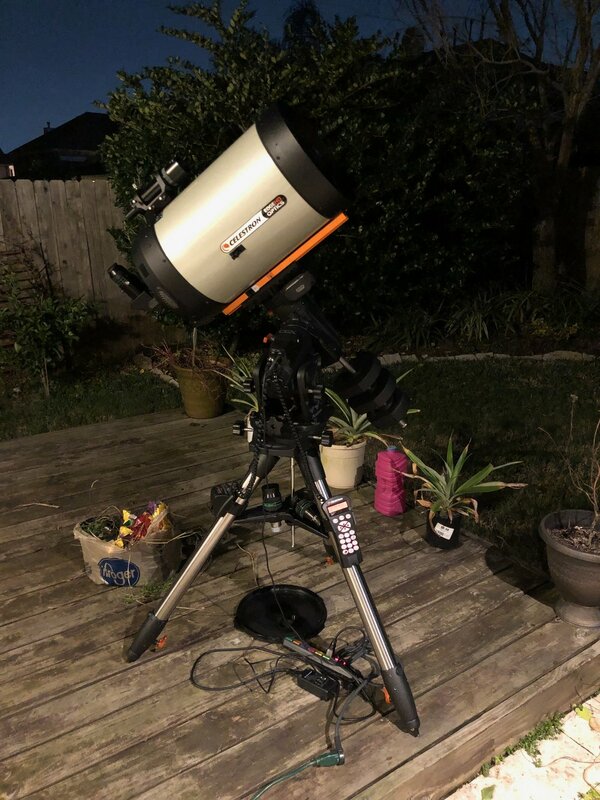 This past holiday, I received a Celestron CGX for Christmas. You might have seen photos of it pop up on some of my other equipment pages. I knew, once I upgraded from the AVX to a mount with more capacity, it was only a matter of time before a large aperture scope entered the picture. Introducing the EdgeHD 11” Schmidt Cassegrain from Celestron. I picked up this scope second hand from a person I work with. They had been ready to upgrade to something even larger. For me, though, moving from a 6” RC to an 11” SCT is quite a jump. Initially I only had a chance to do some quick visual work with it. The views are impressive. Outside of their renowned optics, the focuser and mirror flop are two things the Edge scopes are burdened with that are less than stellar. As you focus to the inside and outside of the focus range, there is slop in the mechanics that cause the mirror to flop from side to side. The only remedy, is to lock the mirror down, and attach a new focuser to the back of the scope. I’m addressing the focuser with a Moonlite CHL 2.5” Large format Crayford Edge focuser. Moonlite has a low profile focuser that works in tandem with the EdgeHD 11” .7x reducer. Reducing down to F7 from F10 will enable me to image at twice the speed for the same signal to noise ratio. The .7x reducer is not only going to aid in imaging time, but also aid in keeping the mount accurate. I think the native 2800mm focal length might be a bit much for the CGX during long duration guiding, and I’ll only reserve that native length for bright planetary objects that don’t require quite as accurate tracking. 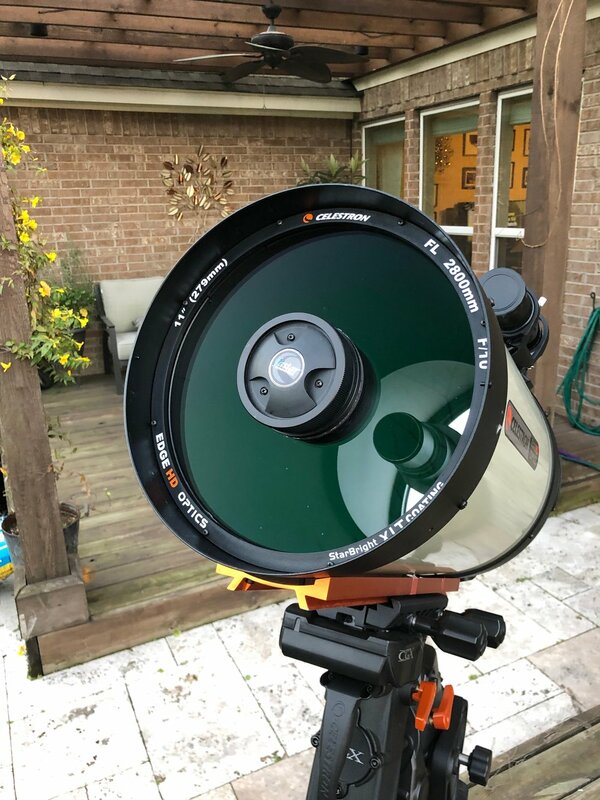 The big benefit of having a large aperture scope like this is that I can begin to image small galaxies and planetary nebulas that were just a bit too small on the 6” scope. I’ve got a dew shield, dew heater, .7x focal reducer, and Moonlite focuser on order. In addition, I added the ZWO Off-Axis Guider for guiding, and the ZWO ASI290MM-Mini guide camera. Longer term, I’d like to try out a new imaging camera like the QHY16200A, but the price of the camera and 2” filters are keeping it out of reach for a while. So to keep the budget down, I opted for a color camera, the ZWO ASI071MC-Pro. It’s currently the largest sensor ZWO puts out, and while the pixel scale at .5 arc seconds is a bit small, it will require extremely good guiding. Out of the box, the CGX performed admirably. The CGX total RMS for my first night out was .7 arc seconds of error. Quite good with no tweaking. I suspect I can keep it low with some effort and improve it as so long as seeing is adequate. This is 15 minutes of guiding on the CGX. Total RMS of 0.78 arc seconds. RA was higher at 0.71, but DEC was pretty low at 0.33 arc seconds. A close up of the imaging train. 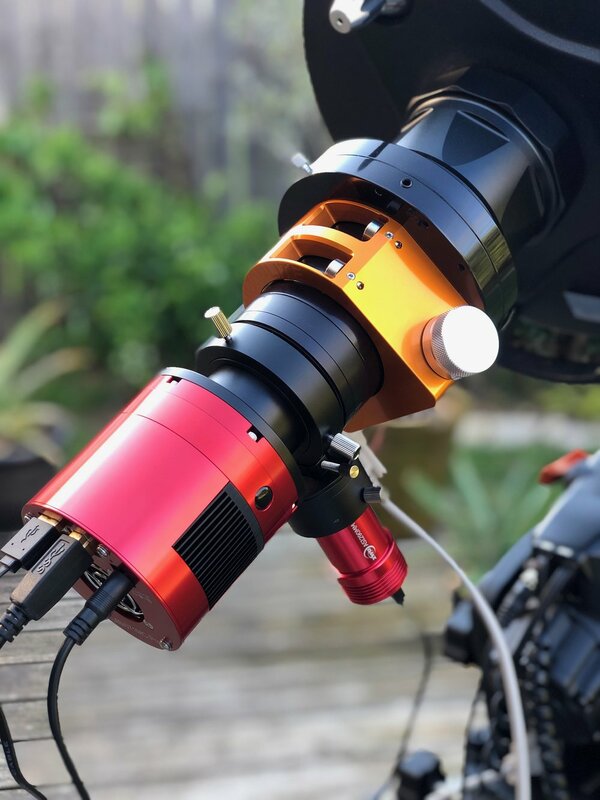 ZWO ASI290MM-Mini guide scope, with the ZWO Off-Axis Guider, a 2” Astronomic L-2 UV/IR block filter, Moonlite CHL large format Edge focuser, and the ZWO ASI071MC-Pro main camera.